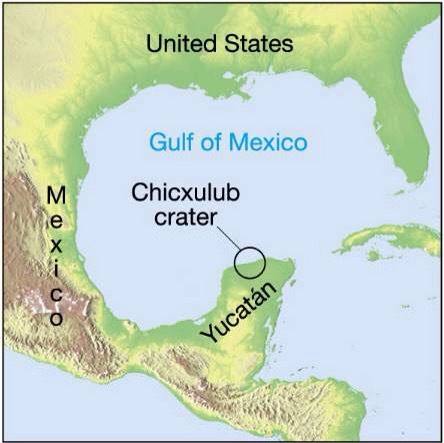 66 million years ago a massive asteroid hit the Gulf of Mexico. This resulted in what we now call the Cretaceous–Paleogene extinction event. Amazingly, much of the earth healed eventually, and new creatures evolved to replace those which had been killed, even the dinosaurs extinction left us with birds, descendants of those mighty creatures. Then, 2.8 million years ago North and South America joined with an isthmus, impacting on living creatures to pass to and fro between these land masses. In the last 14,000 years our ancestors have evolved and spread around the world. By 1800 only 1 billion humans populated the earth. There may have been more at times, but disasters may have befallen other human-like populations. Our current form has multiplied exponentially to a 2017 population of over 7 billion – and counting. We humans began to make life easier by creating cooperative civilisations. Staying in one place and settling began when groups of humans created stability by finding an abundance of water and food through hunting, fishing and gathering resources including cereals. Civilisations developed independently. Archaeologists discovering these lost kingdoms have designated these as ‘cradles of civilisation’. Where art had been given status by the civilisation and preserved in the right geological conditions for us to see thousands of years later, we have the luxury to marvel at the art and compare the findings. 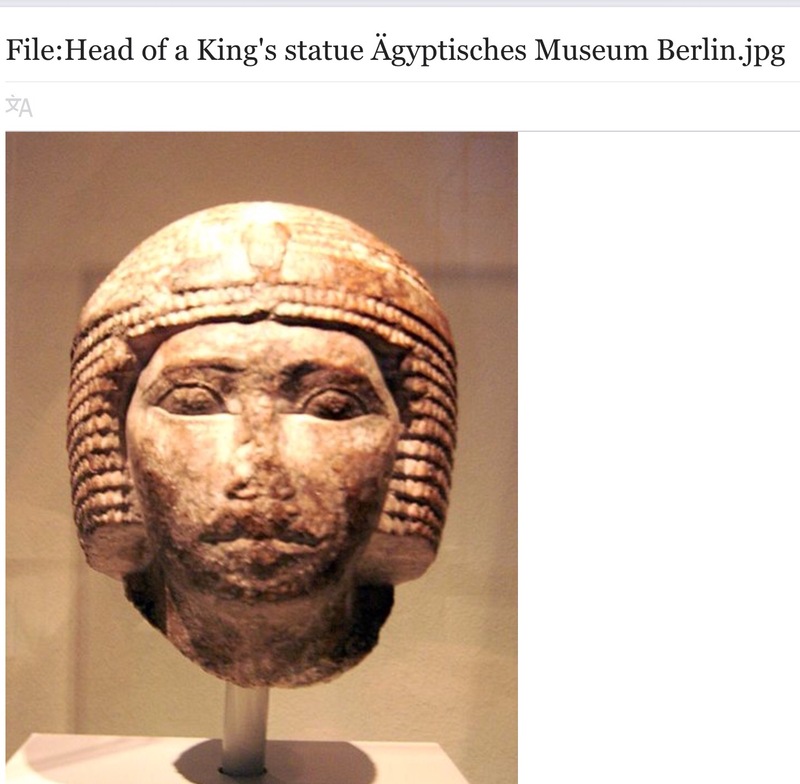 In this blog I am comparing the various civilisations and their sculpting of heads. The Epipaleolithic Natufian culture (/nəˈtuːfiən/) existed from around 12,500 to 9,500 BC in the Levant, a region in the Eastern Mediterranean. The culture was unusual in that it supported a sedentary or semi-sedentary population even before the introduction of agriculture. 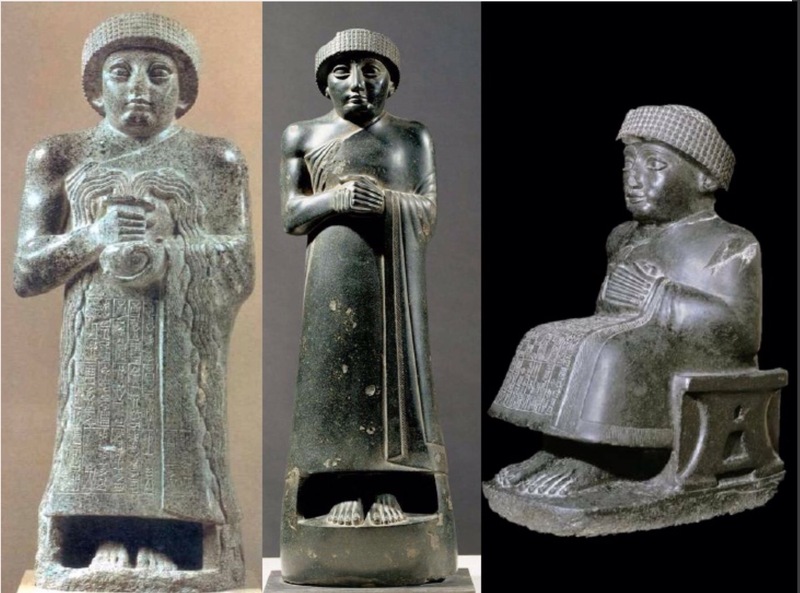 Sumer, the southernmost region of ancient Mesopotamia (modern-day Iraq and Kuwait). The name comes from Akkadian, the language of the north of Mesopotamia, and means “land of the civilized kings”. 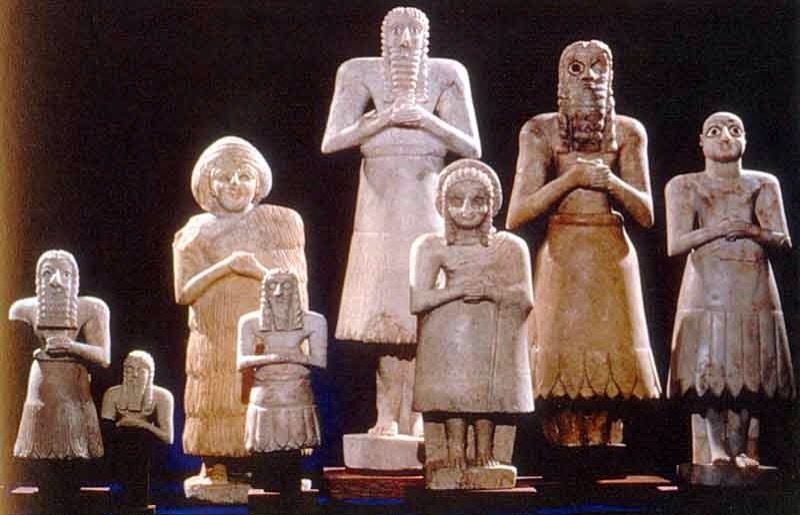 The Sumerians called themselves “the black headed people” and their land, in cuneiform script, was simply “the land” or “the land of the black headed people”. They dominated Mesopotamia for thousands of years. Mesopotamians generally, and the Sumerians specifically, believed that civilization was the result of the gods’ triumph of order over chaos. Whoever these people were, they had already moved from a hunter-gatherer society to an agrarian one prior to 5000 BCE – around 7 thousand years ago. Ancient India is often called the Harappan Civilization because one of the ancient cities was called Harappa. Harappa was just one of 1500 cities in the Indus River Valley. 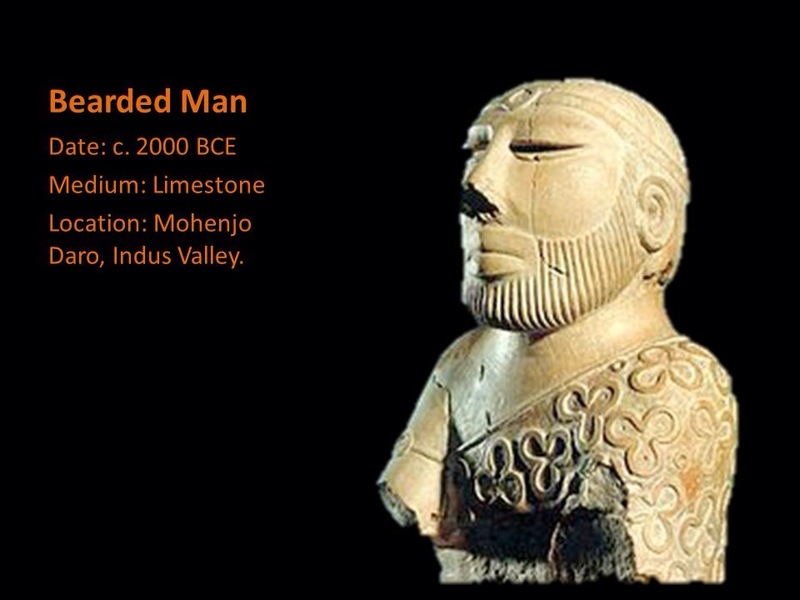 Another well-known city is called Mohenjo-Daro. 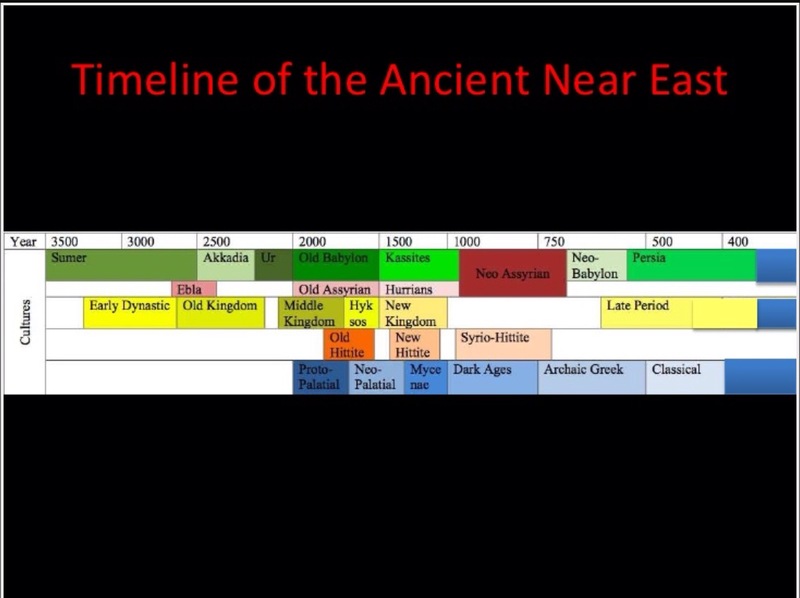 Historians estimate Ancient India to be the biggest of all four early civilizations. The Indo-Gangetic plains of NW India and Pakistan are one of the cradles of Old World Bronze-age civilizations. Here, the Indus civilization (~4.8 – 3.9 thousand years before the present (ka B.P.) formed one of the first urban civilizations, before abruptly declining. Prevailing theory in archaeology suggests that 3rd millennium urbanization was only possible in association with large perennial river systems to provide water for irrigation. In the case of the Indus civilization, the most extensive set of urban settlements occur in a region with no present day perennial rivers. Continued desiccation forced the early ancestors of the Egyptians to settle around the Nile more permanently and to adopt a more sedentary lifestyle. 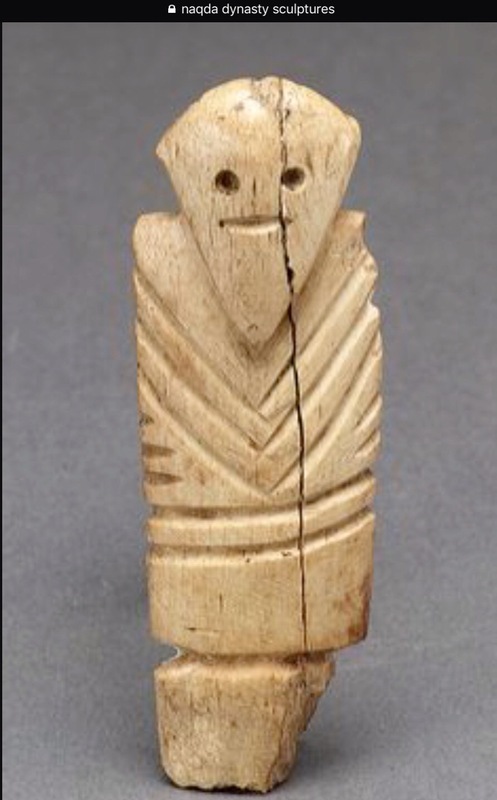 By about 5500 BC, small tribes living in the Nile valley had developed into a series of inter-related cultures as far south as Sudan, demonstrating firm control of agriculture and animal husbandry, and identifiable by their pottery and personal items, such as combs, bracelets, and beads. The largest of these early cultures in upper (Southern) Egypt was the Badari, which probably originated in the Western Desert; it was known for its high quality ceramics, stone tools, and use of copper. The oldest known domesticated bovine in Africa are from Fayum dating to around 4400 BC. The Badari cultures was followed by the Naqada culture, which brought a number of technological improvements. As early as the first Naqada Period, Amratia, Egyptians imported obsidian from Ethiopia, used to shape blades and other objects from flakes. 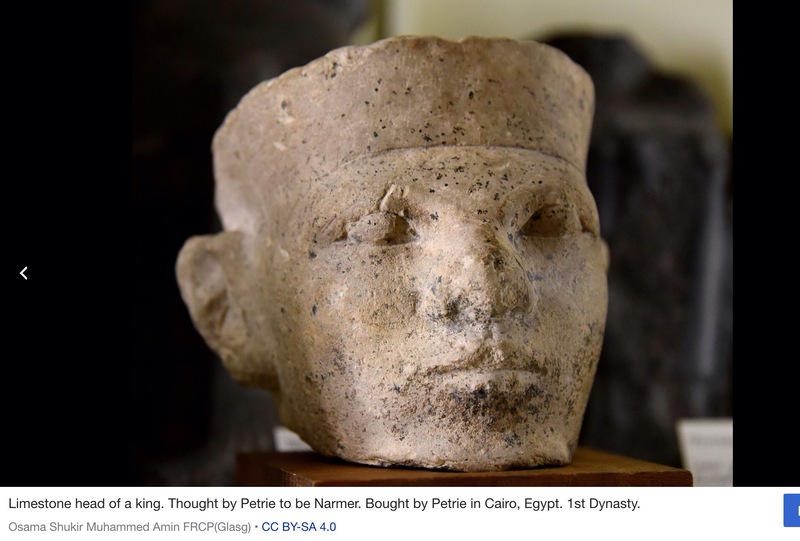 By 3300 BC, just before the first Egyptian dynasty, Egypt was divided into two kingdoms, known as Upper Egypt to the south, and Lower Egypt to the north. Egyptian civilization begins during the second phase of the Naqda culture, known as the Gerzeh period, around 3500 BC and coalesces with the unification of Upper and Lower Egypt around 3150 BC. Farming produced the vast majority of food; with increased food supplies, the populace adopted a much more sedentary lifestyle, and the larger settlements grew to cities of about 5,000 residents. Chinese refer to the Yellow river as “the Mother River” and “the Cradle of Chinese Civilization”. That is because the Yellow River was the birthplace of ancient Chinese civilizations in the Xia (2100–1600 BC) and Shang (1600–1046 BC) eras — the most prosperous region in early Chinese history. Norte Chico has established an earlier estimate for complex societies in the Peruvian region by more than one thousand years. 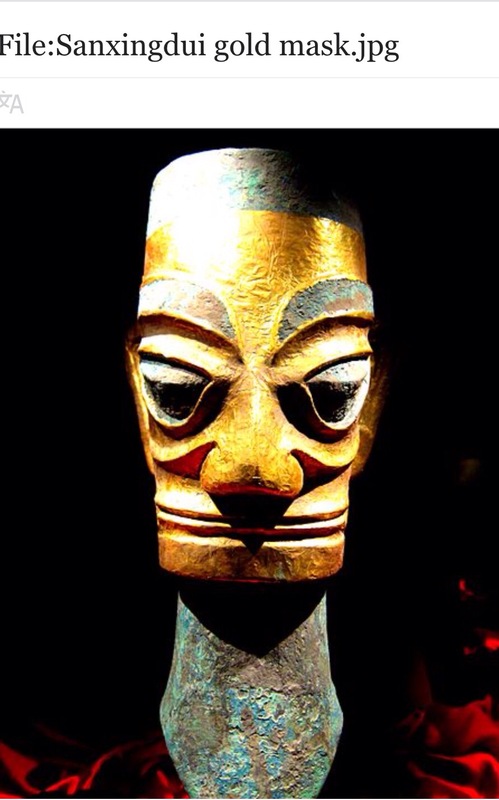 The Chavín culture, circa 900 BC, had long been considered the first civilization of the area. They carved heads with tusks into fortress walls. Evidence of pre Olmec Mesoamericans has been traced to Soconuscoe dated to around the period when the Votive statues (above) were carved. the first civilisation known to us in Mesoamerica. Around 3000 years ago, the ancient Olmec of Mesoamerica, located in Mexico were motivated to sculpt enormous heads out of volcanic rock. Deep in the tropical lowlands of south-central Mexico, (now Veracruz and Tabasco) and out of an evolving small population centred in Soconusco, grew the first largest Mexican civilisation. They were the Olmecs. This was Mesoamerica’s formative period, dating roughly from as early as 1500 BCE to about 400 BCE. Pre-Olmec cultures had flourished in the area since about 2500 BCE, but by 1600–1500 BCE, early Olmec culture had emerged, centered on the San Lorenzo Tenochtitlán site near the coast in southeast Veracruz. They left us amazingly heavy and detailed head sculptures. 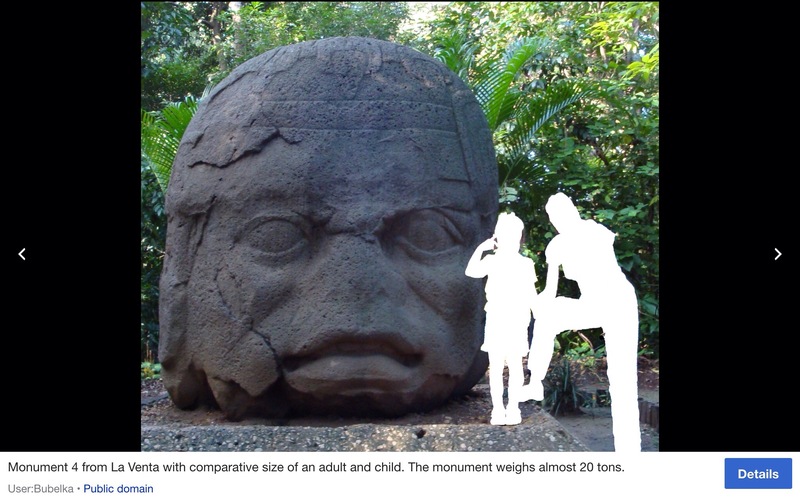 Image of Monument 4 from La Venta with comparative size of an adult and child. The monument weighs almost 20 tons. These fascinating people were capable of great art. 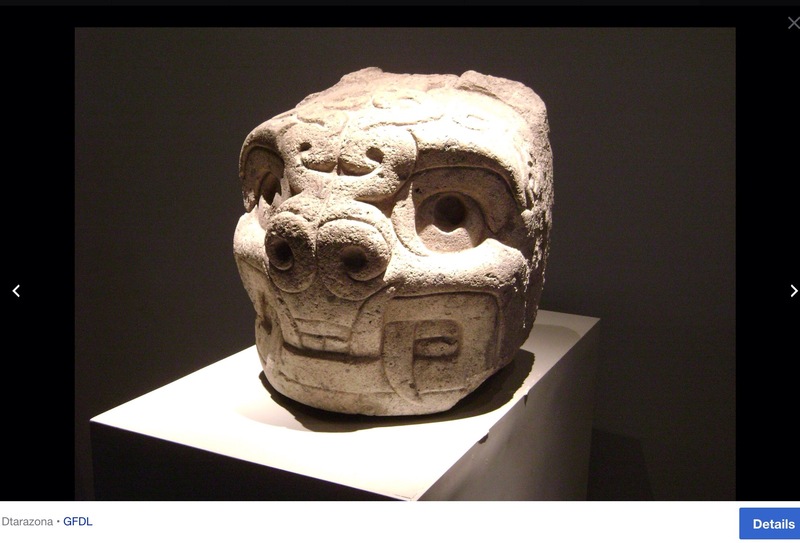 The Olmec civilization was first defined through artifacts which collectors purchased on the pre-Columbian art market in the late 19th century and early 20th century. Olmec artworks are considered among ancient America’s most striking. 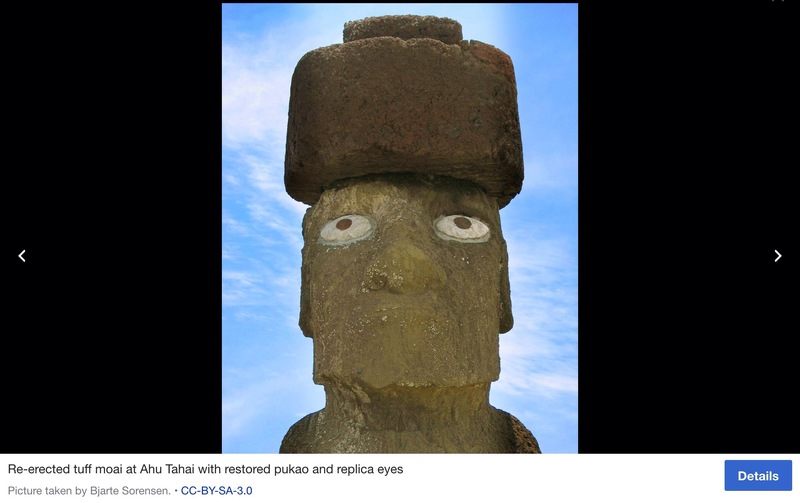 And as if this exercise of carving huge heads and the engineering of moving their immense weight to chosen locations had become something to transmit to some future human population, a few thousand years later it happened again, but on the Pacific Island of Rapu Nui. The powerful image of head sculptures resonates with us today. Even if we can’t view them in situ, we can see from the photographed images, how they seem to strike some deep memory in our ancestral global knowledge. We feel it. We can’t articulate the meaning, but this great effort and artistic skill was, in my opinion, a message to humans then and now. They felt the urge to create iconic heads in overlapping periods of civilisations on different continents, isolated yet somehow connected. We should not minimise the bond of communication which transcends language and is deeply felt by humans who are open to the transmissions. For I am sure it is what makes most of us aspire to be guardians of this planet, rather than destroyers. 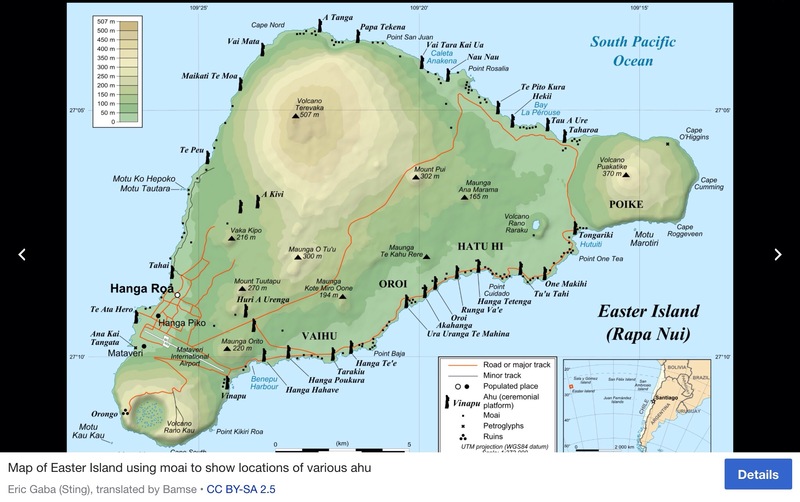 By 1200 C.E, Polynesians settled on Rapa Nui (also known as “Easter Island” – named by the island’s first recorded European visitor, the Dutch explorer Jacob Roggeveen, who encountered it on Easter Sunday (5 April) in 1722, while searching for Davis or David’s island). 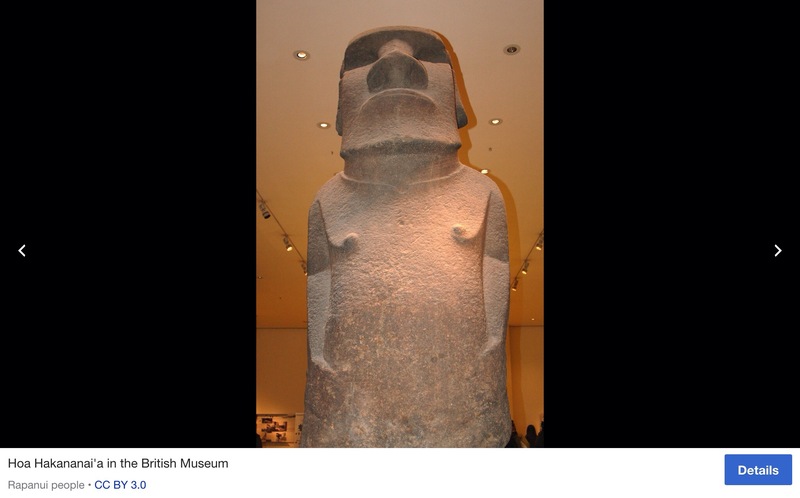 The early Polynesian settlers also felt the urge to sculpt huge heads. These are the famous Moai, but no one can yet explain them. Rapu Nui was annexed by Chile in the late 19th century and now maintains an economy based largely on tourism. 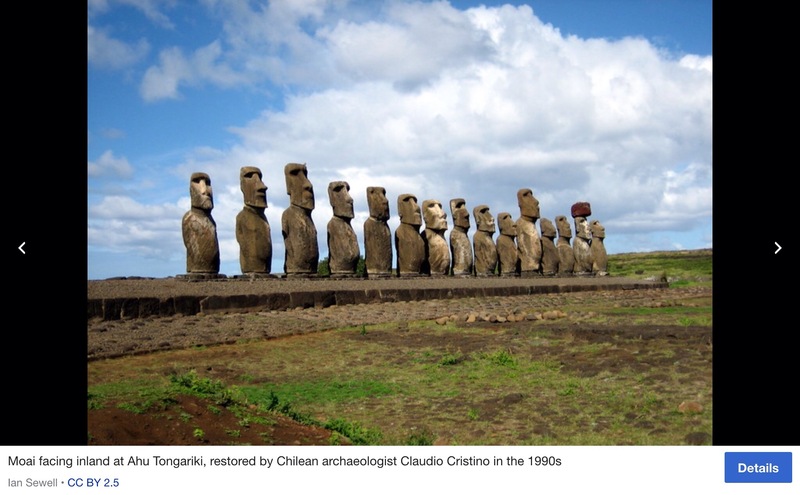 The Rapa Nui people currently make up 60% of Easter Island’s population and have a significant portion of their population residing in mainland Chile. 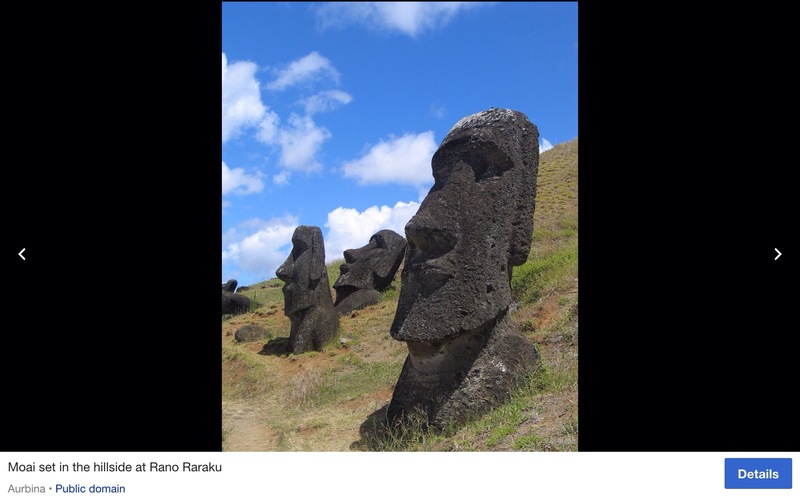 The Moai heads are carved from Tuff, which is an easily carved, compressed volcanic ash. The tuff quarries are located in an extinct volcano called Rano Raraku on the northeastern part of the island [Radford 2012]. The torsos of the heads have sunk into the ground over time, so that the dramatic sight of only heads is what most of us are familiar with (see http://www.eisp.org). This entry was posted in Uncategorized and tagged agrarian history, Americas, ancient sculpture, China, cradle of civilisation, culture, egypt, heads, iconic, India, intelligence, mediterranean, order out of chaos. Bookmark the permalink.